Last night the LAM and I brought baby JL to the PD. This PD is very popular so we always have to go early to queue otherwise it would be really late by the time we are done. At the PD was this woman with 2 kids about 7-8 years of age - by the look of them, I think they were twins. I have seen some Really Horrible Kids but these 2 could easily have topped my list. It was unfortunate that Aden (our 3yo son) spilled his Smarties all over the floor. While I was trying to pick them up, one of the Really Horrible Kids came and stomp on a few of the Smarties, then deliberately walked around me so he could stomp on more. (Of course I had to bark at him.) But not once did his mother get up. Sure, she sat on her pedestal and offered weak instructions like, "Dear, don't bite your shirt!" or "Get up please, don't block the way." but it was her helper who was running around trying to prevent the kids from misbehaving, and of course, she was not very effective in disciplining them either. 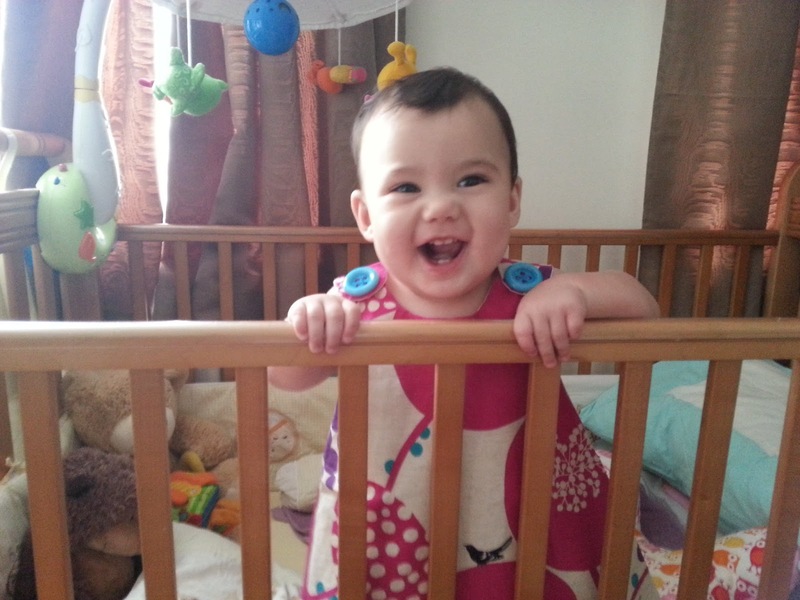 When I was pregnant with our second child, the LAM and I discussed if we should hire a second helper. Our helper's job is to take care of the household chores - she only helped to take care of Aden for an hour or so at times when we were really busy. The LAM and I were worried that my mom (Aden's primary care-giver) would not be able to handle 2 kids at the same time. At the end of the day, we decided against hiring helper #2. We figured that we have muddled through one child, and there are in actual fact, 3 of us altogether, so even when Por Por is not around in the evenings and weekends, the LAM and I should be able to cope. The thing is, the LAM and I have always believed that it is crucial to stop bad behaviours as and when they occur. Hence I was really appalled at how this woman had behaved. If a parent could not be bothered to get off her a** to discipline her children, then how will these kids ever learn what is right and what isn't? Sure, she might have been tired, or stressed, or maybe she really liked her seat, but whatever her reasons were, those kids are HER responsibilities, not her helper's. And why would she think it is acceptable for her kids to behave so badly in a public place? Or maybe she simply does not care? 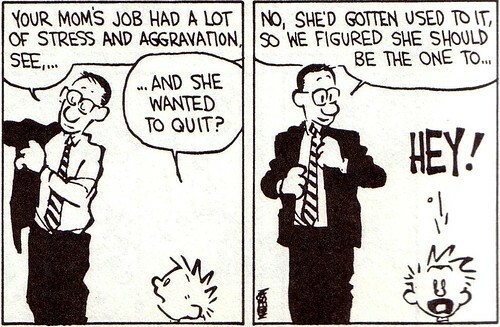 Unfortunately, there are so many parents like this woman in Singapore. How many parties or functions have we attended where kids have been left to run amok? Since when has it become acceptable for children to play in restaurants or supermarkets, regardless of whether they are supervised (usually ineffectively, by a helper) or not? Parenting IS tiring. Kids have way more energy than we do, they get bored easily, and they are forever trying to test boundaries. All parents are tired most, if not all the time. But your kids are your responsibility, not your helper's, not some shop assistant's, and certainly not anyone else's. Please, don't make your kids someone else's problem. It has been a while!!! Yes, yes, you have heard it all before - I have been busy, blah, blah, blah.. In this instance, it happens to be true - I had another baby since my last post, set up another business and have been running around like a headless chicken (what a thought!) trying to hold everything together. Now that my little girl is all grown up, well, all 10 months of her anyway, I have been itching to cook and bake again. My recent obsessions have been mainly Korean - Pajeon (the only Korean food that my hubby (henceforth known as (my) Lord and Master, aka, LAM, will eat willingly - "Korean Pancake!" he says), Doenjang Jjigae, Dwaeji Kalbi, etc, but those are all for another post since I was so excited with the results of those dishes that they were all eaten before I had a chance to take any pictures. A couple of weeks ago, the LAM and I brought our kiddos out for dinner. While I rarely eat dessert, I had a craving for something sweet that night. Since the dessert menu was not very extensive, we ended up ordering a piece of cheesecake to share. The cheesecake was just so terribly so-so that I have been thinking of making one myself for the last 14 or so days. And the problem with that is once an idea gets into my head, I simply cannot dispel it. So! Since we have friends coming over with their kids tomorrow for a swim and dinner date, what better chance to make, yes, you guess it, a cheesecake! The LAM and I have tried making a few types of cheesecake before. We found that we prefer a denser cheesecake. That means a ton of cream cheese. SIGH. My already expanded waistline weeps at the thought, but what is the point of eating cheesecake if it is not cheesy?? Have we all not had some pseudo-cheesecake that had been bulked up with cake or cream, or god knows what else, because cream cheese is not cheap?? SACRILEGIOUS!! As all cheesecakes go, this one started with a digestive biscuit base. The recipe calls for normal digestive biscuits but I happened to have some chocolate ones sitting in my fridge (for emergencies only, I swear!) so I decided to use them instead. 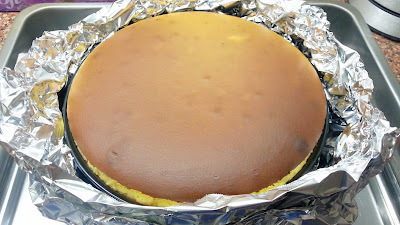 I used a 9-inch Springform Cheesecake pan (the recipes calls for an 8-inch one) and I was a tad worried about there not being enough biscuit base to cover the entire bottom of the pan. It turned out I need not have worried because there was enough - unless you like a really thick base (EEK??) then by all means increase the quantity of the biscuits. I also used my beautiful food processor to blitz the biscuits but I am sure they can be bashed up using a rolling pin. 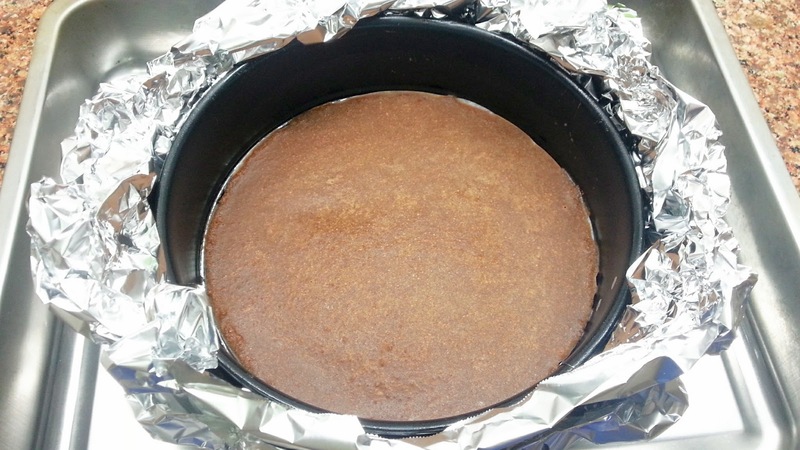 The base was left to set in the fridge for a few hours (or overnight) before I wrapped the base with aluminum foil. I am super KS and used 2 layers of super strong foil because I really, really do not want any water from the bain marie to get into my cheesecake (YUKS). 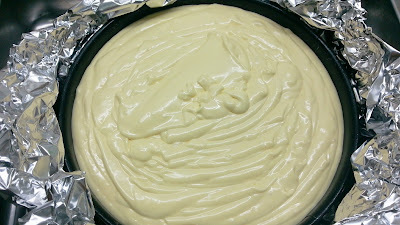 Once that was done, I got on with the cheesecake mixture. I mixed everything together until the batter was smooth and shiny. It is important to taste the mixture and adjust the amount of lemon juice that you use because some lemons are more tart than others. If you are squirmish about eating raw eggs, then a cheesecake is probably not the thing you'd wanna make. YOU MUST TASTE THE MIXTURE BEFORE YOU BAKE IT! And then pour it over the base. 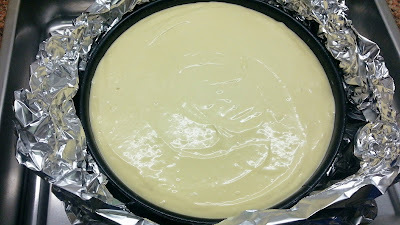 Smooth with a spatula, and you will have the most beautiful looking cheesecake ready to be baked! The other important thing about making a cheesecake is that you need to keep an eye on it towards the end. I don't mean constantly opening the oven door to peek (NO NO NO!) but to sort of press the top very gently to check the if it is ready. 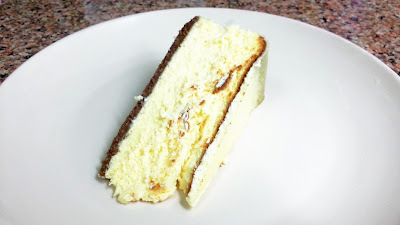 Personally I prefer a cheesecake that is more "set" (firmer to the touch) but once the LAM and I baked a cheesecake and it was not as "set" as we would normally have it and he loved it! So it is a matter or trial and error and finding that right firmness at the end of the day. At this stage, the top of the cake is firm enough to not collapse under the weight of the topping that I shall be using but it is still very wobbly beneath. This cake is so pretty! Pity that the top will be covered with a sour cream topping. The topping is optional but I think that it does complement the cheesecake. 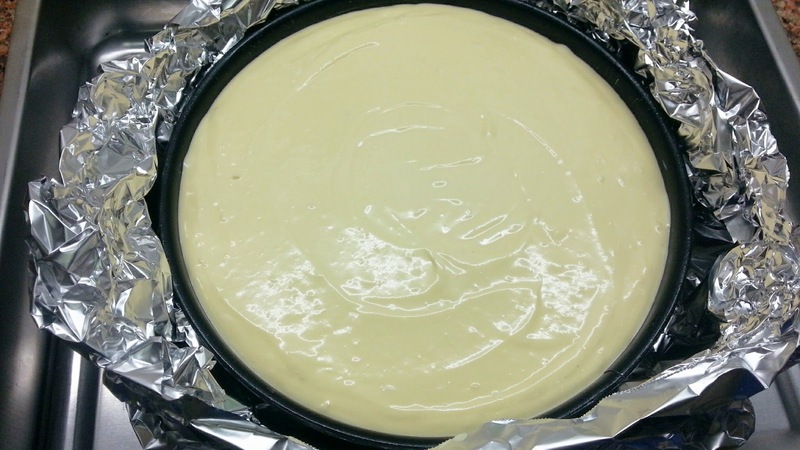 If you do not want to put the topping then simply bake the cake for about 10-15 more minutes. I simply made the topping and then used the back of a spoon to spread it around. Process the biscuits until they are like crumbs, then add the butter and pulse again. Line the bottom of a 20cm springform tin, pressing the biscuits in with your hands or the back of a spoon. Put the tin in the fridge to set, and preheat the oven to 180ºC/gas mark 4. 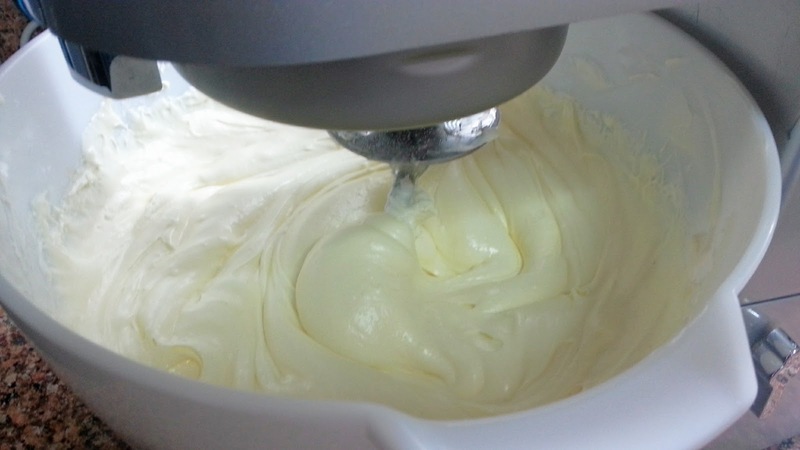 Beat the cream cheese gently until it's smooth, then add the sugar. 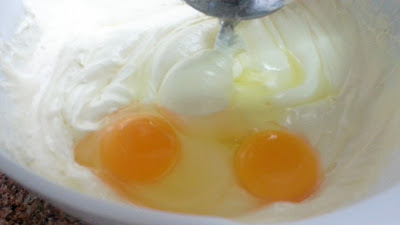 Beat in the eggs and egg yolks, then finally the vanilla and lemon juice. Put the kettle on. Pour the cream-cheese filling into the chilled biscuit base, and then pour hot water from the recently boiled kettle into the roasting tin around the cheesecake. It should come about halfway up; don't overfill as it will be difficult to lift up the tin. Put it into the oven and cook for 50 minutes. 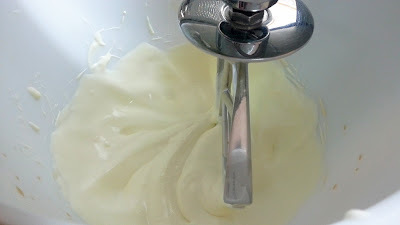 It should feel set, but not rigidly so: you just need to feel confident that when you pour the sour cream over, it will sit on the surface and not sink in. 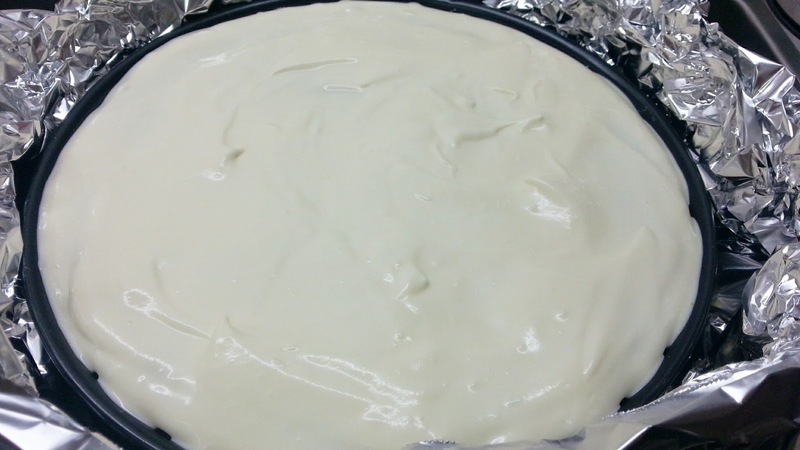 Whisk together the sour cream, sugar and vanilla for the topping and pour over the cheesecake. Put it back in the oven for a further 10 minutes. Take the roasting tin out of the oven, then gingerly remove the Springform, unwrap it and stand it on a rack to cool. When it's cooled down completely, put it in the fridge, removing it 20 minutes before eating to take the chill off. Unmould and when you cut into it, plunge a knife in hot water first.